Sean Dyche accepts his side are "pretty much" safe after their home draw with West Brom. 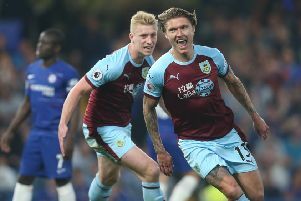 Regardless of the result of Swansea City's home game with Everton, due to finish in around an hour or so, Burnley would be six points clear of Hull City with six available, with a 19-goal goal difference swing required from the Tigers. At the time of writing, Swansea led Everton 1-0, with Burnley mathematically safe if they fail to win. "But there's a massive goal difference swing, particularly with two games left. "We'll wait, but it's pretty much." Burnley led through Vokes, only for Salomon Rondon and Craig Dawson to put the visitors ahead, before a late Vokes leveller: "I thought we did well in the game, they're a tough side, very tough to break down, everyone knows about Tony's teams, they're a huge side, as big a team as I've seen. "We delivered a very good first half performance, when we got the goal we deserved to be in front. "We conceded a poor goal from our point of view, with a couple of defections on the way to landing for him, and then they scored from a set piece, which they have the capability of doing - they're the highest set piece scorers in the division. "Forget about your set up, when you have that many big players, it's hard, without worrying about runs and delivery. "Our reaction to that was fantastic, the mentality of the group I've never questioned. "Our strong jaw was on show again, we kept going, we kept working, I was pleased with the substitutions - they affected it." Vokes netted the opener after Ashley Barnes was fouled by Jake Livermore, but picked himself up to pull the ball back for his strike partner: "Vokesy was outstanding last week, outstanding again today. "I presume the referee was going to give it, I'm not too bothered now we've scored. "But it was a penalty, I've seen it back, Barnesy gets tripped and gets his shirt pulled. "What I am pleased with, it's rare we get paid back, but he didn't dive, he went down and didn't roll around, jumped up, got the ball, played it across and Vokesy scored."